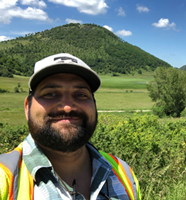 Alan Pitts is a Ph.D. candidate at the University of Camerino and coordinator of the University of Camerino/George Mason University Geology Field Camp. He earned his bachelor's degree in geology at George Mason University in Fairfax, Virginia. He then graduated with an MSc degree in Environmental Resources and Risks from the University of Camerino in 2016. During his MSc program, Alan worked on channelized turbidite systems in the Miocene Gorgoglione Flysch Formation in the Southern Apennines. His Ph.D. project is focused on using traditional field mapping combined with UAV-based photogrammetry to characterize stratigraphic architecture in syntectonic marine thrust-top basin successions in the Southern Apennine Chain.